Another remake seemingly no one was asking for, the new mega-budgeted RoboCop is a dud that does nothing to improve upon the original. The 1987 Paul Verhoeven-directed RoboCop is a classic of multiple genres: action, sci-fi, and comedy. It transcended its low-budget scrappiness with boundless imagination. Why even try to recapture the magic? Studios would be better off combing their back catalogs for movies that showed potential but didn’t capitalize on it. Remake those. Leave the classics alone. It might seem unfair to endlessly rant about how the original still holds up perfectly well, instead of assessing the new film purely on its own terms. 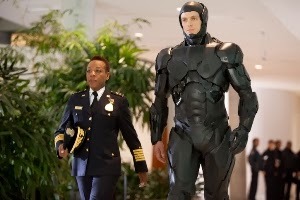 But like so many remakes, the 2014 RoboCop is inextricably linked to its predecessor, making it difficult (if not impossible) to ignore Verhoeven’s earlier satirical vision of the future. The satire is gone, for the most part, and with it the scathing humor. And before any cries foul that this one’s PG-13 rating constitutes some sort of commercially-motivated “selling out,” consider two points. First of all, the super-bloody squib effects of the ’87 version, while envelope-pushing for their time, were nowhere near solely responsible for making the film great. That movie had a lot more going for it than gore. Secondly, the new film’s body-horror elements (displaying protagonist Murphy as a castrated, torso-less head – lungs and trachea exposed through transparent casing) are FAR more squirm-inducing and disturbing than anything in the original. Ironically, it’s the PG-13 remake that’s more liable to cause nightmares for impressionable young viewers. The new film opens in Tehran, where lumbering ED-209s (military-issue law enforcement robots) are keeping the peace while U.S. media reports about the successful reduction in crime. In a moment that flirts with subversiveness, the “terrorists” are actually portrayed as citizens rebelling against the police state that their city has become. Unable to differentiate between a man with a bomb and a boy holding a knife, the robots indiscriminately mow down anyone their software deems a “threat.” Back in the States, it’s this inhuman element that prevents OmniCorp (the manufacturers of the military robots) from being able to implement their creations in domestic police forces. Raymond Sellers (Michael Keaton), OmniCorp CEO, hits upon the idea of inserting a man (or at least a human brain) into one of their robot suits. When police officer Alex Murphy (Joel Kinnaman, TV’s The Killing) is nearly killed in a car bombing, his brain, face, and right hand are salvaged and filled out by robotic parts. Some robot purists, including tech-savvy Rick Mattox (Jackie Earle Haley, playing a gung-ho cliché), think that RoboCop’s emotions are a liability. 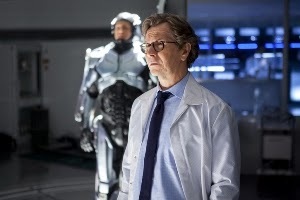 But after some tweaking by Dr. Dennett Norton (Gary Oldman), the man responsible for morphing Murphy into Robocop, the human-machine hybrid becomes an unstoppable crime-fighting unit. The foreign policy intro has, by this point, been long abandoned in favor of some vague ethical debates between Dr. Norton and Sellers over how much manipulation is acceptable when dealing with a human. Does Murphy have a soul? Are his memories and emotions more powerful than the chemical altering OmniCorp applies to his brain? Are the presence of Murphy’s wife (Abbie Cornish) and child (John Paul Ruttan) enough to override the control that the corporation believes it has over him? Don’t bother pondering these questions too deeply. Director Jose Padilha and screenwriter Joshua Zetumer certainly didn’t. That would be fine, actually, if RoboCop delivered thrilling action and awesome effects. But despite being a relatively trim 108 minutes, this thing is a snoozer. It’s most imaginative visuals are the aforementioned gross-out medical stuff (Murphy having his brain tinkered with and his blood cleansed – yuck). And the action doesn’t really kick in until halfway through, and even then it’s only intermittent. Kinnaman and Oldman are the most committed to taking their roles seriously, but Samuel L. Jackson phones in his blowhard political commentator role (Pat Novak, host of the show The Novak Element, and staunch supporter of robot cops). Jay Baruchel seems totally out of his depth as the profit-driven head of OmniCorp’s marketing department, relying more than ever on his ersatz-Christian Slater characteristics. 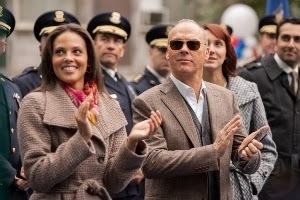 Though clearly intended as a hat-tipping tribute, any and all references to Verhoeven’s RoboCop only underline how depressingly generic and inferior this new one is by comparison. We get the original musical theme, Kinnaman’s first suit is very similar to that worn by Peter Weller’s Murphy, and there’s even some variations on classic dialogue (Mattox says, “I wouldn’t buy that for a dollar” after an unimpressive display of robot combat). Of all the things worth carping about, the worst offense is the absence of any clear-cut, hissable villains. The first film had the inimitable trifecta of Kurtwood Smith, Paul McCrane, and Ray Wise – three guys that audiences absolutely loved to hate. On top of that, Murphy’s partner is treated almost as an incidental day player – nowhere near as endearing as Nancy Allen’s Officer Lewis.